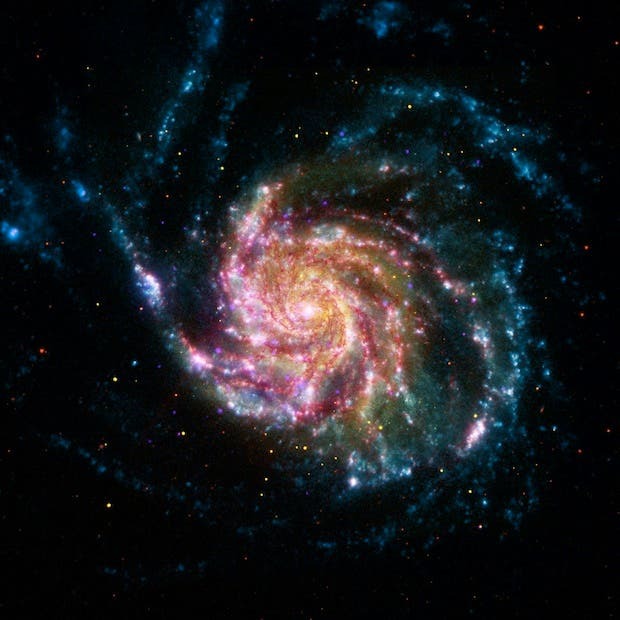 This NASA image obtained May 25, 2012, of the Pinwheel Galaxy, or M101, combines data in the infrared, visible, ultraviolet and X-rays from four of NASA's space telescopes. The Pinwheel galaxy in the constellation of Ursa Major (also known as the Big Dipper), is about 70 percent larger than our own Milky Way galaxy, with a diameter of about 170,000 light-years, and sits at a distance of 21 million light-years from Earth, which means that the light we're seeing in this image left the Pinwheel galaxy about 21 million years ago — many millions of years before homo sapiens ever walked the Earth. The view shows that both young and old stars are evenly distributed along M101's tightly wound spiral arms. The red colors in the image show infrared light, as seen by the Spitzer Space Telescope. These areas show the heat emitted by dusty lanes in the galaxy, where stars are forming. The yellow component is visible light, observed by the Hubble Space Telescope. Most of this light comes from stars, and they trace the same spiral structure as the dust lanes seen in the infrared. The blue areas show ultraviolet light, given out by hot, young stars that formed about 1 million years ago. The Galaxy Evolution Explorer, which NASA recently loaned to the California Institute of Technology in Pasadena, Calif., captured this component of the image. Last, the hottest areas are shown in purple, where the Chandra X-ray observatory observed the X-ray emission from exploded stars, million-degree gas and material colliding around black holes. The Pinwheel Galaxy is nearly twice the size of our Milky Way. The glowing lights indicate massive stars, black holes and supernova explosions, all wrapped in the hot gas "arms" of the galaxy. "Type Ia supernova are the kind we use to measure the expansion of the Universe. Seeing one explode so close by allows us to study these events in unprecedented detail," said Mark Sullivan, the Oxford University team leader who was among the first to follow up on this detection. Astronomers believe they caught a supernova within hours of its explosion last year in the Pinwheel, a rare feat made possible with a specialized survey telescope and state-of-the-art computational tools. Joshua Bloom, assistant professor of astronomy at the University of California, Berkeley, called it "the supernova of a generation." Astronomers at Lawrence Berkeley National Laboratory (Berkeley Lab) and UC Berkeley, who made the discovery predict that it will be a target for research for the next decade, making it one of the most-studied supernova in history. The supernova, dubbed PTF 11kly, was discovered by the Palomar Transient Factory (PTF) survey, which is designed to observe and uncover astronomical events as they happen. "We caught this supernova very soon after explosion. PTF 11kly is getting brighter by the minute. It's already 20 times brighter than it was yesterday," said Peter Nugent, the senior scientist at Berkeley Lab who first spotted the supernova. Nugent is also an adjunct professor of astronomy at UC Berkeley. "Observing PTF 11kly unfold should be a wild ride. It is an instant cosmic classic." Nugent credits supercomputers at the National Energy Research Scientific Computing Center (NERSC), a Department of Energy supercomputing center at Berkeley Lab, as well as high-speed networks with uncovering this rare event. The PTF survey uses a robotic telescope mounted on the 48-inch Samuel Oschin Telescope at Palomar Observatory in Southern California to scan the sky nightly. As soon as the observations are taken, the data travels more than 400 miles to NERSC via the National Science Foundation's High Performance Wireless Research and Education Network and DOE's Energy Sciences Network (ESnet). At NERSC, computers running machine learning algorithms in the Real-time Transient Detection Pipeline scan through the data and identify events to follow up on. Within hours of identifying PTF 11kly, this automated system sent the coordinates to telescopes around the world for follow-up observations. Three hours after the automated PTF pipeline identified this supernova candidate, telescopes in the Canary Islands (Spain) had captured unique "light signatures," or spectra, of the event. Twelve hours later, his team had observed the event with a suite of telescopes including the Lick Observatory (California), and Keck Observatory (Hawaii) and determined the supernova belongs to a special category, called Type Ia. Nugent notes that this is the earliest spectrum ever taken of a Type Ia supernova. Catching supernovae so early allows a rare glimpse at the outer layers of the supernova, which contain hints about what kind of star exploded. "When you catch them this early, mixed in with the explosion you can actually see unburned bits from star that exploded! It is remarkable," said Andrew Howell of UC Santa Barbara/Las Cumbres Global Telescope Network. "We are finding new clues to solving the mystery of the origin of these supernovae that has perplexed us for 70 years. Despite looking at thousands of supernovae, I've never seen anything like this before," Howell added. "The ability to process all of this data in near real-time and share our results with collaborators around the globe through the Science Gateway at NERSC is an invaluable tool for following up on supernova events," said Nugent. "We wouldn't have been able to detect and observe this candidate as soon as we did without the resources at NERSC." "The best time to see this exploding star will be just after evening twilight in the Northern hemisphere in a week or so," said Oxford's Sullivan. "You'll need dark skies and a good pair of binoculars, although a small telescope would be even better." '"Before that, you'd have to go back to 1972, 1937 and 1572 to find more nearby Type Ia supernovae," says Nugent. Stephen Hawking and many astronomers believe that one of the most plausible reasons we have yet to detect intelligent life in the universe is due to the deadly effects of local supernova explosions that wipe out all life in a given region of a galaxy.